Photo: Morris House, ca. 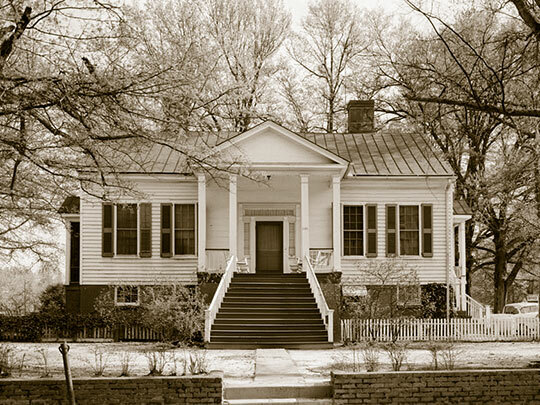 1840, 220 East Morris Street, Anderson, SC. Photographed by Jack E. Boucher, 1960, Historic American Buildings Survey [HABS SC-323], memory.loc.gov, accessed December, 2013. The Anderson County Courthouse is located at 100 South Main Street, Anderson SC 29624; phone: 864-260-4643. Anderson County is part of the old Cherokee Indian lands, deeded to the State in 1777. A few pioneers had settled in the reign prior to that date, but after the treaty made the district safe for white people, settlers poured in rapidly. By 1790 the Cherokee territory, covering 8 per cent of South Carolina, had more than 10 per cent of the State's free population. In 1789 the present counties of Anderson, Pickens, and Oconee became Pendleton District, with the courthouse in Pendleton. In 1826 Anderson County was created out of the district and for the courthouse a central location was selected on the 'General's Road,' the highway used by General Andrew Pickens in traveling from Abbeville County to his home, 'Tamassee,' in Oconee County. This old road is Anderson's Main Street. Town and county were named in honor of General Robert Anderson, Revolutionary soldier, who in 1801 had founded a river port called Andersonville about 12 miles from Anderson. Destructive freshets and the transfer of interest to the county seat made of Andersonville only a memory.